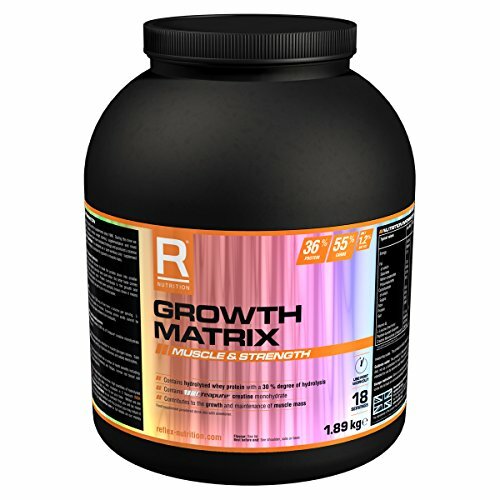 Growth matrix was developed by the reflex research and development team with a no compromise approach to formulate the most comprehensive and potent post workout product available. During a strenuous workout, the body will utilise its own store of energy called glycogen. The body's immediate need after training is to replenish this lost energy to aid recovery. Numerous research studies have shown fast digesting glucose polymers are the preferred source of carbohydrate to replenish glycogen. During a strenuous workout, micro damage occurs to the muscle tissue, which needs to be repaired so muscle growth can take place. Muscle tissue is essentially made of protein. To aid this recovery process, additional protein is required. Growth matrix provides an incredibly fast digesting type of protein called hydrolysed whey protein. Hydrolysed whey protein is whey protein that has been treated with enzymes to break the protein down into smaller peptides and amino acids. The benefit is that your body can absorb peptides much faster than whole proteins, meaning growth matrix starts the process of recovery almost immediately. To complement the hydrolysed whey, growth matrix also benefits from the inclusion of 7 g of free form l-leucine, arguably the most important amino acid when it comes to signaling new muscle growth.each serving of growth matrix contains 5,000 mg of peptide bonded glutamine and 2,500 mg of creapure creatine monohydrate--two important ingredients for replenishing glutamine and creatine phosphate levels after an intense workout or exercise. With such high quality, high dose ingredients, the taste of growth matrix is very subjective, however reflex is confident that once you feel and see the benefits you will be happy regardless. If you have any questions about this product by Reflex, contact us by completing and submitting the form below. If you are looking for a specif part number, please include it with your message.